I love movies about as much as I love food. So when you can combine the two loves, what could be better? Here are my top favorite movies scenes where food plays an important role in character development. It’s in no particular order because I just couldn’t decide! 1) National Lampoon’s Animal House (Directed by John Landis, 1978): I think I’ve watched this movie 100 times, and it never gets old. John Belushi plays the role of a mischievous college student, John Blutarsky, to perfection. His facial expressions are classic. Nothing beats a classic food fight scene in a cafeteria . . .
2) To Kill a Mockingbird (Directed by Robert Mulligan, 1962 and book written by Harper Lee, 1960): I love the scene where Walter Cunningham goes to the Finch house for lunch. Walter requests maple syrup so that he can pour it all over his lunch. Scout starts making fun of him, and the housekeeper, Calpurnia, quickly escorts Scout out to give her a lesson on manners. It reminds me of another favorite movie, Elf, starring Will Ferrell. Will’s character, Buddy, also has a love for the sweet stuff. 3) 9 1/2 Weeks (Directed by Adrian Lyne, 1986): I rented this movie probably around the age of 13. Mom & Pop rental stores didn’t care what kids rented back then. The only two things I remember from this movie is 1) Mickey Rourke being super cool and hot and 2) The food scene in front of an open refrigerator. I feel the same way now as I did when I was a kid: Who is going to clean up that mess??? 4) Psycho (Directed by Alfred Hitchcock, 1960): This is my favorite movie of all time!!! I just finished reading a book about the making of Psycho by Stephen Rebello, and I highly recommend it if you enjoy the movie. Most people would say they remember the shower scene, or the Detective falling backwards down Norman Bates‘ stairway, or the ending when the killer is revealed. All great parts! But I love the scene in the backroom of the hotel office when Marion Crane (Janet Leigh) and Norman Bates (Anthony Perkins) have an intimate discussion over a sandwich Norman has made for his new hotel guest. It’s a simple sandwich on white bread, and Norman notices Marion “eats like a bird.” She responds that he should know given his hobby of taxidermy. At that moment you know this is not going to end well. Brilliant! By the way, click on the highlighted Norman Bates link above to see a very bizarre commercial. 5) Silence of the Lambs (Directed by Jonathan Demme, 1991) You have John Blutarsky at one end of the spectrum and Hannibal Lecter at the other! Hannibal Lecter, the cannibalistic serial killer, is a character that sticks in your head whether you like it or not. Anthony Hopkins couldn’t have played this part any better. What’s really interesting is that I read that Hopkins only has a total of 16 minutes of screen time. That’s shocking considering he IS the movie! Want to come over for a nice bottle of Chianti? 6) Willy Wonka and the Chocolate Factory (Directed by Mel Stuart, 1971) I can’t remember when I first watched this movie. All I know is that I’ve seen it a million times, and I love it! The best part of this movie, based on the book by Roald Dahl, is how dark it is. I’ve never been a huge fan of the romantic comedy. Give me Clockwork Orange or West Side Story and I’m one happy camper. Those are the kinds of movies that get to me. Willy Wonka starts out with a poor multi-generational family all under one very small roof. Charlie Bucket gets the golden ticket, and next thing he knows he and Grandpa are whisked away to a candy wonderland filled with a quirky cast of characters. The entire movie is food based. What could be better? 7) Fatal Attraction (Another movie Directed by Adrian Lyne, 1987) Glenn Close is spectacular as Alex Forrest, the one night stand from hell. I love that she cooks Dan Gallagher, played by Michael Douglas, a wonderful spaghetti dinner and cooks Dan’s wife a completely different kind of meal – to the dismay of Dan’s little daughter. 8) When Harry Met Sally (Directed by Rob Reiner, 1989): I’m embarrassed to admit that I almost left this movie out until my husband mentioned it! I love every scene in this movie, but everyone remembers one scene in particular. Billy Crystal (as Harry Burns), Meg Ryan (as Sally Albright), and all of the fellow diners (including Rob Reiner’s mom with the great one liner at the end) made this scene one of the most memorable movie scenes of all time! 9) 16 Candles (Directed by John Hughes, 1984): What is better than sitting on a dining room table in a god awful bridesmaid dress with a birthday cake and a hot guy who owns an even hotter Porsche? What girl didn’t want to be Samantha Baker (played by Molly Ringwald)??? I mentioned the cake, right? 10) Blazing Saddles (Directed by Mel Brooks, 1974): This movie is not known as a foodie movie, but there is one scene that can’t be ignored when making a list like this one. All I can remember is my Dad crying laughing to this scene. It’s been a favorite movie of mine ever since! This one’s for you, Dad . . .
1) Gigi (Directed by Vincente Minnelli, 1958): This is a movie that I watched as a kid and loved it for certain reasons (beautiful outfits and amazing music), and then as an adult I realized that Gigi is basically being prostituted out by her grandmother. But I still love it! It’s like an old version of Pretty Woman, but with much more style and class! 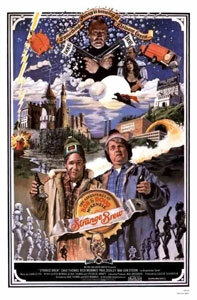 2) Strange Brew (Directed by Rick Moranis and Dave Thomas, 1983): This is one of the most stupid movies, but I still like it, eh. And it’s all about beer, eh. Beauty. I love how food can add to the development of a character! So what’s your favorite movie scene centered around food? I hope you enjoyed the list! Take Care and Happy Eating! I would love to spend a day at Willy Wonka’s bliss factory. Now you got me craving something sweet! I think I am the only person who still has not seen 16 candles- I really need to get on that. Great list Megan! 16 Candles is a must! So many good movies to see! Thanks for taking a look at my list! I vote for Animal House and Silence of the Lambs. I really can’t pick a fav. Just like when I order food – I can never make up my mind! Blazing Saddles….ahh…what memories, I can still see the tears streaming down Dad’s face…love your list, and love 16 Candles….Long Duk Dong….”The Donger need food”…priceless! I knew you would appreciate Blazing Saddles, too! Ha! The Donger! Classic 80s! Glad there are some Strange Brew fans out there. I need to watch that one again. It’s been too long, eh?